Hello folks, today I am back with another trick. Now it was possible to change your IMEI number rooted phone. This trick is 100% working in rooted android phones. You can apply this trick in any mobile brand like Samsung, sony, Lenovo, etc. The International Mobile Equipment Identity or IMEI is a number, usually unique, to identify 3GPP (i.e., GSM, UMTS and LTE) and iDEN mobile phones, as well as some satellite phones. It is usually found printed inside the battery compartment of the phone, but can also be displayed on-screen on most phones by entering *#06# on the dialpad, or alongside other system information in the settings menu on smartphone operating systems. The IMEI number is used by a GSM network to identify valid devices and therefore can be used for stopping a stolen phone from accessing that network. For example, if a mobile phone is stolen, the owner can call their network provider and instruct them to “blacklist” the phone using its IMEI number. This renders the phone useless on that network and sometimes other networks too, whether or not the phone’s SIM is changed. FOLLOWING TRICK IS FOR EDUCATIONAL PURPOSE ONLY. WE DON’T ENDORSE SUCH ACTIVITIES OR ANY ILLEGAL WORKS. It requires xposed module too. 2. Gives the permission of xposed module. 3. Open the application then you will see that their was option to edit your IMEI number. 4. 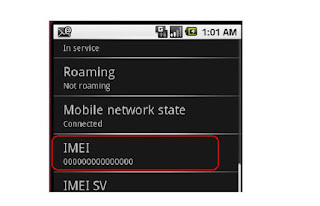 Now click on random button then it will automatically choose any random IMEI number. 5. Then you are ready to rock.